The Wii to HDMI Converter support Wii game console input, widely used in home entertainment, and various game sites. 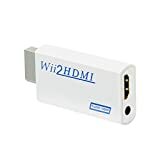 Wii HDMI converter converts the standard Wii output into an HDMI 1.3 compatible device allowing audio and video to be carried over a single HDMI cable. It outputs video and audio in full digital HDMI format and supports all Wii display modes (NTSC 480i 480p, PAL 576i). The Wii to HDMI Adapter can connect with PC speakers and headset directly.No power adaptor, no messy cords--With just one HDMI cable, plug and play for true-to-life video/audio effects on your TV/monitor. Wii to hdmi convertor no setup required: Plug it in, plug in the HDMI cable and you are all set. Picture and color are what you expected.